Dada Pota Show of 21-12-2018. The only program of business and economy in Pakistan. Dada Pota Show 21-12-2018 based on IMF New Taxes Bailout Electricity Prices Development Funds LPG Political Economy. Today, Dada G shared his opinion on important news that Govt offers IMF Rs190b in new taxes for bailout. Pakistan has offered the International Monetary Fund (IMF) to impose Rs190 billion worth of additional taxes to restrict budget deficit to Rs2.2 trillion and to further increase interest rates and devalue currency to increase foreign exchange reserves to $13 billion. These aggressive policy measures have potential to stifle economic growth rate, slowing its pace to only 3.9% in this fiscal year and stoking inflation. A major inflationary measure will be increase in sales tax rates on locally sold textile, leather, surgical, sports and carpets goods, which are currently charged at lower than standard rates. The petroleum products will also be subject to further taxation. The fiscal and monetary proposals are part of the draft memorandum of Economic and Financial Policies that Pakistan shared with the IMF for securing a bailout package, sources in the Finance Ministry told The Express Tribune. The plan also includes over Rs300 billion anticipated earnings from sale of two government-owned LNG-fired power plants. Pakistan proposed these measures after the IMF assessment revealed that the country’s overall budget deficit could still widen to Rs2.4 trillion or 6.1% of the Gross Domestic Product (GDP) at end of this fiscal year even after a mini budget introduced just three months ago. Finance Minister Asad Umar on Wednesday told a parliamentary committee that his government may unveil second mini budget within four months – in early January. 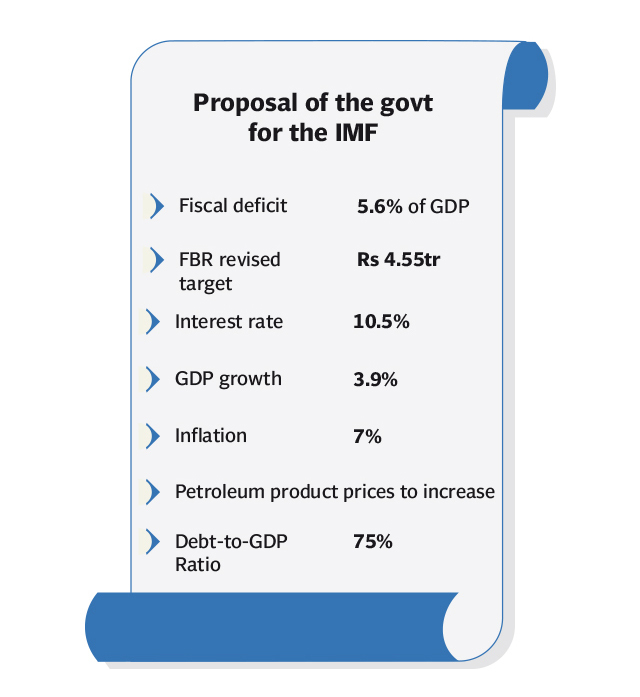 As a result of these new measures, the government hopes that the budget deficit could be restricted to 5.6% of the GDP or Rs2.2 trillion in the first year and to 4.5% or Rs2.6 trillion at the end of the IMF programme. In addition to taking Rs190 billion additional revenue measures, Pakistan has also proposed that quasi-fiscal losses will be cut by Rs380 billion in this fiscal year alone. However, the IMF has not yet accepted Pakistan’s position of allowing budget deficit equal to 5.6% of the GDP in this fiscal year. It seeks to bring the deficit below 5% in this fiscal year and below 4% at the end of the IMF programme. Pakistan and the IMF on Wednesday held another video conference aimed at narrowing down their differences. “Fruitful discussions were held and the IMF raised certain queries on the policy document,” said the Finance Ministry spokesperson Dr Najeeb Khan. He said both the sides have agreed to keep engaged to further narrow down the policy differences. The government has also assured completely ending price differential subsidies in three years period, sources further revealed. But the IMF was asking an upfront increase in electricity tariffs by Rs3.82 per unit including Rs1.27 per unit increase that the government has already allowed. The government has also promised to recover cost of syndicated loans taken from the banks to retire circular debt from the end consumers by building in the tariffs. Except for 200 monthly units’ consumers, the subsidies for all other categories will come to an end under the IMF programme. The government has given an overarching assurance to the IMF that Pakistan will make adjustments in fiscal policies, would tighten import regime and a monetary policy will primarily aimed at targeting inflation. Revenue measures Without new measures, the Federal Board of Revenue’s (FBR) tax collection has been projected to increase to just Rs4.1 trillion. With a combination of currency devaluation and new taxes, the collection could jump to Rs4.5 trillion in this fiscal year, Rs5.8 trillion by June 2020 and Rs7 trillion by June 2021. Pakistan has proposed that it will increase sales tax rate on petroleum products in addition to further increasing petroleum development levy rates. The federal excise duty on beverages will be imposed. The locally manufactured and imported vehicles could be slapped with federal excise duty. Similarly, the withholding tax rates on non-filers and on imports of finished goods will be massively increased. The government has also hoped recovering Rs75 billion that are currently stuck up in courts. The Supreme Court of Pakistan has also set up special bench to hear tax relates cases. The non-tax revenue collection target has been proposed to be increased to Rs1.2 trillion on back of privatisation proceeds of two power plants and sale of 3G and 4G licenses by the Pakistan Telecommunication Authority (PTA). It has also proposed to the IMF that the current expenditures on account of those subjects that have been transferred to the provinces will be gradually reduced. Pakistan has proposed to increase tax revenues by 3% of the GDP to 18.1% by 2021-22. The FBR’s tax collection has been proposed to be increased from 11.2% to 13.9% in three years. But this would require massive tax efforts, particularly in the next fiscal year when Pakistan will have to collect more than Rs5.7 trillion in taxes, the sources said. Compared to increase in tax revenues, the expenditures have been proposed to slash from 17.4% of the total size of economy to 16.5% in three years. The PSDP spending will be drastically slashed from 4.2% of the GDP last year to 3.5% by end of the IMF programme. In absolute terms, the PSDP spending will not be more than Rs850 billion even after four years. The defence expenditures have been projected to increase from Rs1.1 trillion this year to Rs1.7 trillion by June 2022. The interest payments would touch Rs2 trillion mark by June 2019 and will hit Rs3.5 trillion by June 2022. Because of these reasons, the public development spending will be slashed. Monetary and exchange rate policies The government has proposed that it stood ready to further adjust the exchange rate in the current fiscal year, which would also be a tool to get additional revenue collection at the import stage. Further currency devaluation will be close to the adjustment made in October. The interest rate will be further adjusted in the next monetary policy announcement. The increase could be between 50 basis points to 100 basis points over the current rate of 10%, the sources said. These measures would help build up foreign exchange reserves to around 2.5 months of import or $13 billion at the end of this fiscal year. But all this will hurt the economic growth rate that will plunge to 3.9% this year – down from 13-year high level of 5.8%. The agriculture sector is expected to take a major hit and could grow only 1.5%, industrial sector 4.5% and services sector 4.4%. Even at the end of the IMF programme, the economic growth rate will be still lower than what the Pakistan Muslim League-Nawaz (PML-N) government had left last year. “The economic growth rate will be subdued in the first year but the sustainable rate will pick up from ensuing years,” said Dr Khaqan Najeeb while commenting on the possible adverse impacts of the IMF programme. There will also be a condition to ask four commercial banks, two of them in the private sector, to meet their minimum capital requirements. A national financial stability council will also be setup by the SBP. The sources said against the free float demand by the IMF, the SBP has proposed to pursue flexible exchange rate policy. It has also assured the IMF that in future the central bank will target only inflation and economic growth rate will not be a major consideration. There will be strict restrictions on the federal government from borrowing from the State Bank of Pakistan (SBP). The SBP has also assured that it will lift restrictions on advance import payments against the letters of credit (LCs) and other administrative measures taken in the recent months to contain pressures on the balance of payments. As part of the central bank autonomy, the term of the SBP governor could be increased to five years from three years, the sources said. There will be new criteria for the appointments of SBP governor, deputy governors and the Monetary Policy Committee members. By & large, Dada G & Pota G presented a very good show. We received huge feedback in the form of SMS & facebook posts. If you missed today’s Dada Pota Show, there is no need to worry because you are just a click away. You can download and listen it now. “Dada Pota” show on-air at www.dadapota.pk.